Ever go shopping and wish you could find something that was more ‘you’? Maxine is going to show you how to upcycle a plain t-shirt with our free template to give your fashion the personal feel you’re looking for! Print the free template and cut out the flowers and leaf designs, you want to use. Draw around the flowers and leaves on to your chosen Dovecraft coloured felt and cut out. Place the flowers and leaves on the t- shirt, when you are happy with the design, pin the pieces in place. Take the leaves and back stitch along the centre, pin the leaves back on the t-shirt. 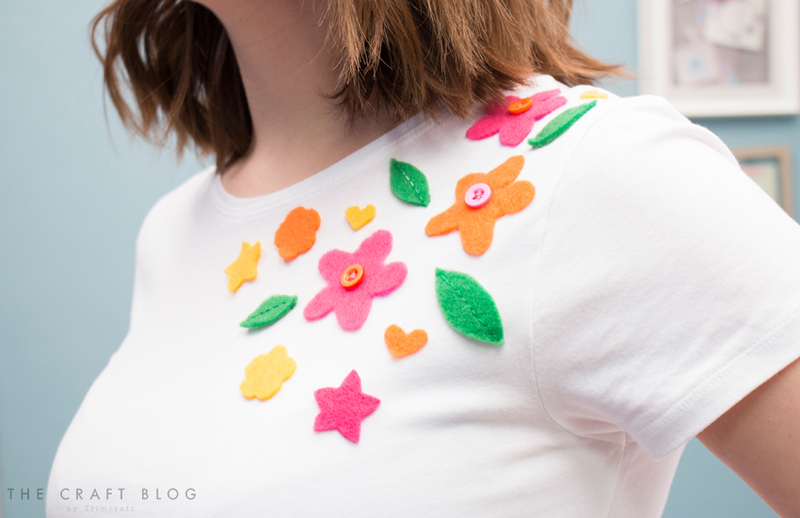 Sew the buttons on to the larger flowers, pin them back on the t-shirt. Use the cotton to stitch the flowers and leaves on to the t-shirt. Stitch from the back of the t-shirt, taking care not to sew all of the way through the felt. How adorable is this upcycled t-shirt design? The bright colours really makes this white shirt come to life! You could use our free template to upcycle a denim jacket, a bag and so much more! How will you use our free template? We would love to see so don’t forget to #trimcraft when uploading your projects to social media and to share your makes in the inspiration area!